There was a book last decade by Thomas Frank, What’s the Matter with Kansas?, that asked why lower-income voters in the state didn’t vote for greater levels of redistribution. The author claimed these voters were sidetracked by cultural issues, which may very well be part of the story. I like to think that these Kansans also were motivated by ethics and that they realized it would be wrong to use government coercion to take money from other people. And maybe, unlike the folks at the IMF, they were not motivated by envy and they realized that high taxes and more redistribution would make them worse off over time because of the negative impact on overall prosperity. Well, it appears that the folks in Kansas aren’t that different from people in India, Morocco, Nigeria, Mexico, and South Africa. At least that’s the takeaway from some new research that Christopher Hoy wrote about for the World Bank. Here’s the issue he investigated. Social commentators and researchers struggle to explain why, despite growing inequality in many countries around the world, there is often relatively limited support among poorer people for policies where they are set to benefit (such as increases in cash transfers or in the minimum wage). …Conventional theories of preferences for redistribution, such as the Meltzer-Richard Hypothesis, imply that if poor people were made aware they were relatively poorer than most other people in their country, they would become more supportive of redistribution. Yet there is little empirical evidence that evaluates this prediction. …empirical evidence is needed to understand how poorer people’s misperceptions of their relative position in the national income distribution effects their support for redistribution. Here’s the methodology he used. I conducted the first cross country survey experiment on preferences for redistribution in the developing world… The experiment involved over 16,000 respondents in five developing countries that make up almost 25% of the global population (India, Nigeria, Mexico, South Africa and Morocco). …To test whether informing poor people of their relative position in the national income distribution makes them more supportive of redistribution, I randomly allocate half of the respondents in each country to be told which quintile their household belongs to in the national income distribution (based upon their reported household income and the number of household members). …After the treatment they were asked if they thought the gap between the rich and poor was too large and whether the government was responsible for closing this gap. And here are some of the results. People tend to think they are in the middle of the income distribution, regardless of whether they are rich or poor. …poor people who perceived themselves to be in the bottom two quintiles of the distribution were between 15 to 28 percentage points more likely to prefer lower levels of inequality than poor people who perceived themselves to be in the top two quintiles. 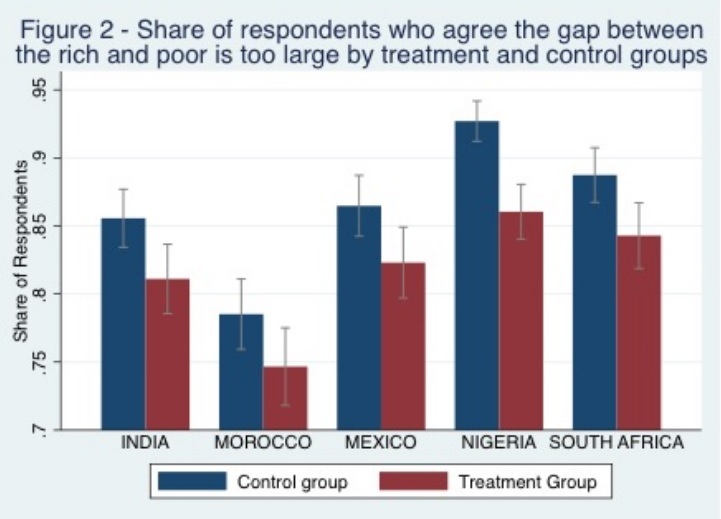 …Surprisingly, telling poor people that they are poorer than they thought makes them less concerned about the gap between the rich and poor in their country…there was no effect from the treatment on these people’s support for the government to close the gap between the rich and poor. Here’s a chart showing how people became less sympathetic to government-coerced redistribution after learning more about their own economic status. The author speculates on possible reasons for these results. A plausible channel that is causing this effect is people using their own living standard as a ‘benchmark’ for what they consider acceptable for others. …people…realise two points. Firstly, there are fewer people in their country with a living standard they considered to be relatively poor than they had thought. Secondly, what they had considered to be an ‘average’ living standard (their own standard of living) is actually relatively poor compared to other people in their country. I show how both of these points would lead people to respond by being less likely to be concerned about the gap between the rich and poor in their country. …there are opposing channels through which poorer people’s preferences for redistribution respond to information about their relative position. On the one hand, poorer people may be more supportive if they are set to benefit from redistribution. However, on the other hand they may be less supportive if they are less concerned about the absolute living standard of people who are relatively poor. These are all plausible answers. Though I have the same questions about this research as I did about Frank’s book. Do people in these five developing nations have any level of moral aversion to redistribution and/or do they understand (at least implicitly) that a tax-and-redistribute model is a recipe for national economic decline? Perhaps a more practical way of looking at the issue is to ask whether lower-income people care most about economic growth or economic inequality. Many of the professional left, including the ideologues at the IMF, are fixated on the latter and they’re willing to hurt the poor if the rich suffer even greater harm (in other words, Margaret Thatcher was right about their motives). By contrast, I strongly suspect the average lower-income person is far more interested in more prosperity for their family and far less concerned about the prosperity of the rich family on the other side of town. They presumably are unaware of the powerful Chinese data on poverty reduction and inequality, but they instinctively understand that a rising tide lifts all boats. Indeed, I constantly explain that spending is what diverts resources from the productive sector of the economy, regardless of whether outlays are financed by taxes or borrowing. This is why a spending cap is far and away the best rule for fiscal policy. 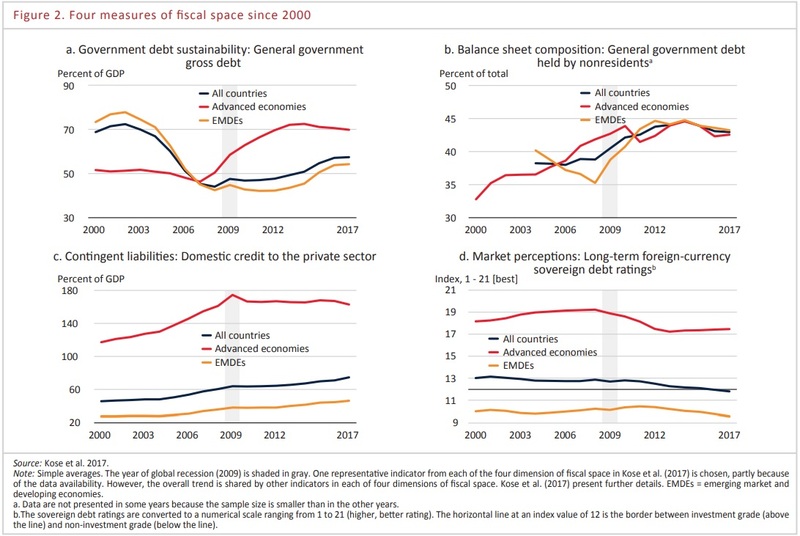 Fiscal space improved during 2000−07, but has shrunk around the world since the global financial crisis. …debt sustainability indicators, including government debt and fiscal sustainability gaps, have deteriorated in at least three-quarters of countries in the world. …and perceptions of market participants on sovereign credit risks have worsened. 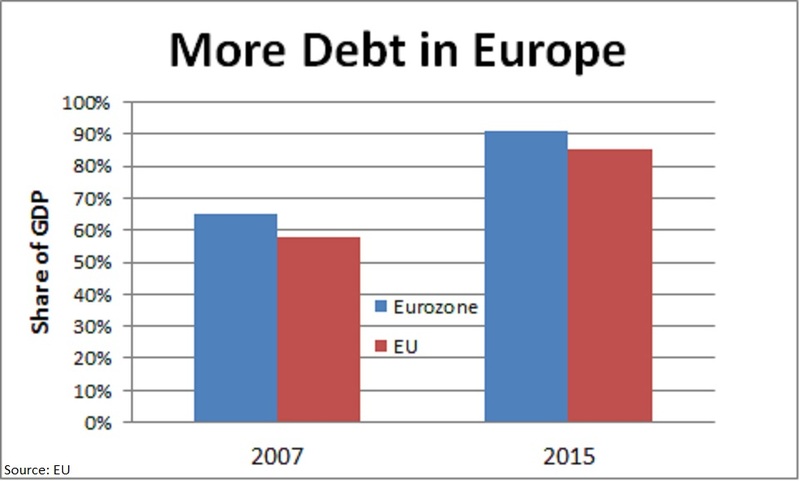 …Since 2011, fiscal space has shrunk in EMDEs. …fiscal deficits widened to 3 to 5 percent of GDP in 2016, on average… Government debt has risen to 54 percent of GDP, on average, in 2017. …EMDEs need to shore up fiscal positions to prevent sudden spikes in financing costs… Fiscal space has been shrinking in EMDEs since the global financial crisis. It needs to be strengthened. When asked to pick the worst international bureaucracy, I generally respond as follows. The International Monetary Fund (IMF) or Organization for Economic Cooperation and Development (OECD) should be at the top of the list. Both of those bureaucracies aggressively push statist policies designed to give governments more power over people. I have mixed feelings about which one deserves to be called the worst bureaucracy. Next on my list are the United Nations (UN) and European Bank for Reconstruction and Development (EBRD). Many people are surprised the UN isn’t higher on the list, but I point out that the organization generally is very ineffective. Meanwhile, the EBRD is relatively unknown, but I have total disdain for its cronyist business model (basically a global version of the Export-Import Bank). At the bottom of my list is the World Bank (WB). I don’t have knee-jerk hostility to the WB, in part because the bureaucrats historically have their hearts in the right place (reducing poverty) and even occasionally support the right policies (social security reform and regulatory relief). Nonetheless, I was disappointed earlier this year to learn that the Trump Administration decided to give more money to the World Bank. The Trump administration is backing a $13 billion increase in funding for the World Bank… The change…will allow the bank to increase lending to poor-country clients… The U.S. is the only country with veto power over any changes in bank structure, so funding increases cannot proceed without Washington’s support. …The shift to U.S. support for more funding at the Bank took some European governments by surprise, said Suma Chakrabarti, president of the European Bank for Reconstruction and Development, a London-based multilateral bank lending in Europe, the Middle East and North Africa. He said in an interview Thursday that the capital increase is “very good news,” since it would help efforts to reduce global poverty. …Mr. Mnuchin said he would work with Congress to secure approval for the U.S. contribution, a step that has in the past proved challenging. Hopefully it will prove impossible rather than challenging to get approval for more funding (though I haven’t been following the issue, so maybe Republicans in Congress already have okayed an expansion). Assuming the decision hasn’t yet been made, I have some evidence showing why the World Bank doesn’t deserve more funding. And not merely because aid is not the route to prosperity. Consider the misguided advice that the World Bank is pushing on Romania. The Romanian government should…consider switching the flat income tax to a progressive tax, said World Bank chief economist for Europe and Central Asia, Hans Timmer. …The World Bank representative…referred to the flat tax rate…, stating that they should think about whether this system is still appropriate. The World Bank’s advice would be to rethink the entire labor market taxation system in coordination with other countries in the region, and not just make small changes. ”We can not tell you what the solution is, but you need to analyze everything, including the single tax, and whether you’d be better off implementing a progressive tax system, meaning those who earn more pay more,” Timmer said. This is horrible advice. The flat tax is very conducive to prosperity and Romania needs fast growth to help offset the damage caused by decades of communist enslavement. Moreover, there are problems with corruption in Romania and the World Bank has admitted that tax complexity facilitates corruption. 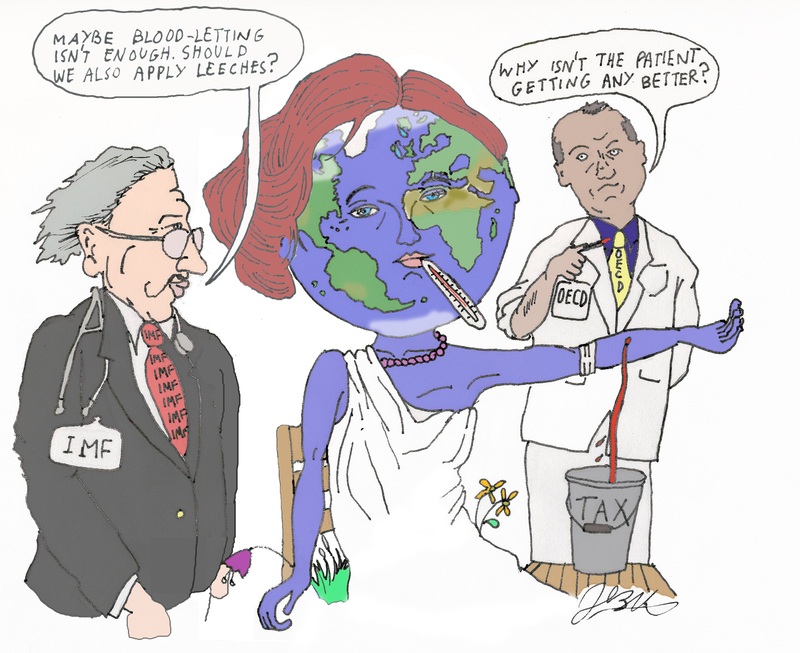 Given Mr. Timmer’s misguided musings, I may need to get a new version of my cartoon about international bureaucracies. Especially since the World Bank once produced a study giving nations higher grades for having more oppressive tax systems. P.S. 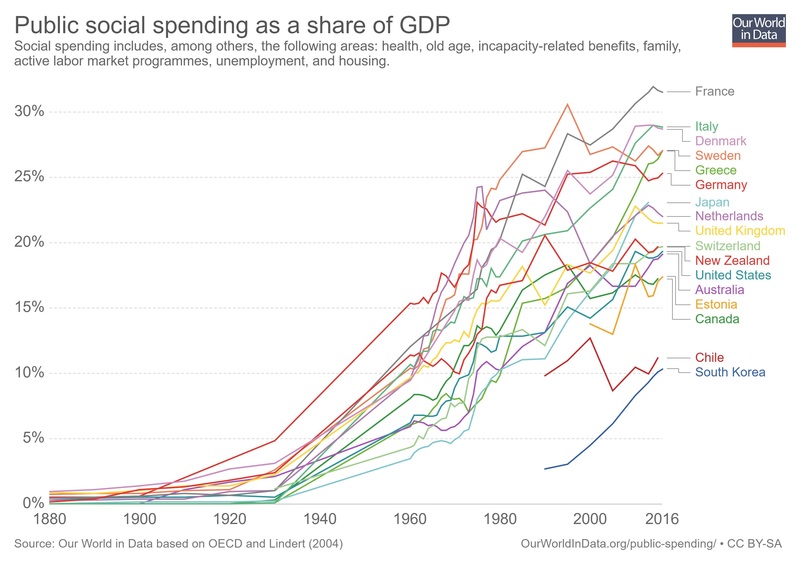 In fairness, the WB has produced some good work on government spending, dependency, financial regulation, and free markets. P.P.S. And I especially like the World Bank’s comparison of Chile and Venezuela. To be blunt, I don’t think the World Bank should exist. We don’t need an international bureaucracy to promote economic development in poor nations. Particularly since the policies that we know will work – free markets and small government – oftentimes are hindered by intervention from multilateral institutions such as the World Bank. For example, I’ve spent the past few days in Vanuatu, where I’ve been fighting against the adoption of an income tax, and I’ve been repeatedly told that the World Bank is one of the groups (along with the Australian Tax Office) urging the adoption of this anti-growth levy. It is both depressing and upsetting that outsiders are seeking to hinder growth in this poor nation, but what really galls me is that World Bank bureaucrats (like their colleagues at other international bureaucracies) are exempt from paying any income tax. All this being said, my general philosophical hostility (and, in Vanuatu, targeted genuine anger) toward the World Bank doesn’t preclude me from admitting when the bureaucracy does good work. It has played a positive role in helping some nations set up private retirement systems, and it has produced research warning about the link between corruption and complicated tax systems. Perhaps most laudable, the World Bank every year publishes Doing Business, an index that dispassionately measures the degree to which government policy imposes costs on those who create and operate companies. Indeed, it was just two months ago that I wrote about the most recent issue (mostly to grouse that America is falling in the rankings, so thanks Obama). All of which puts me in a strange position, because although I have written that the World Bank is my “least despised international bureaucracy,” I never thought I would dedicate an entire column to defending its work. But a friend formerly known as the Princess of the Levant sent me an article by José Antonio Ocampo and Edmund Fitzgerald, which attacks Doing Business for…gasp…encouraging tax competition. Since I’m a knee-jerk defender of tax competition (and bearing in mind that the enemy of your enemy is sometimes your friend), I feel obliged to jump into the debate and defend the World Bank’s report. Here’s the basic argument of Ocampo and Fitzgerald. …there is a serious flaw in the report’s formula: the way it treats corporate taxation. …The problem is that “regulatory burden,” according to Doing Business, includes…promoting budget-straining tax competition among countries… This may sound like an argument for overhauling Doing Business’ “paying taxes” indicator. But what is really needed is for Doing Business to drop that indicator altogether…when it comes to the paying taxes indicator, the report has things all wrong. Indeed, it runs counter to the global consensus on the need for effective international cooperation to ensure equitable collection of tax revenues, including measures to limit tax avoidance by multinationals and other private firms. A race to the bottom in corporate taxation will only hurt poor people and poor countries. If Doing Business is to live up to its own slogan, “equal opportunity for all,” it should abandon the tax indicator altogether. Wow. I find it remarkable that leftists openly argue in favor of suppressing information on tax policy because of their ideological hostility to tax competition. For all intents and purposes, they’re admitting that taxes do matter. The article also makes some other assertions that deserve a bit of attention. Most notably, the authors repeat the silly claim by some leftists that the way to get more growth is with a bigger government financed by higher taxes. Yet if it’s true that big government stimulates growth, why did the world’s richest nations become rich when government was very small and taxes were largely nonexistent? Ocampo and Fitzgerald somehow want people to believe that if a little bit of government spending is associated with good economic results, then this somehow means a lot of government must be associated with better economic results. Maybe somebody should introduce them to the concepts of diminishing returns and negative returns. And once they master those concepts, they’ll be ready to learn about the Rahn Curve. Heck, there’s even a World Bank study I can recommend for them. Though the authors do raise one semi-decent point. Some of the taxes paid by companies actually are borne by workers. Ocampo and Fitzgerald don’t seem to understand how this works since they jumble together some taxes that are borne by labor with other that are borne by capital, but there is a kernel of truth in their argument. 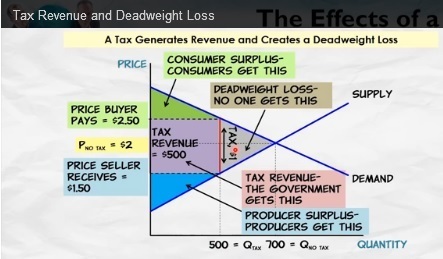 Doing Business exaggerates the tax burden on companies. For one thing, it considers all the kinds of taxes firms might pay – not just corporate income tax. Specifically, the report’s estimates for “total tax rate as a proportion of profits” include taxes for employees’ health insurance and pensions; property and property transfers; dividends, capital gains, and financial transactions; and public services like waste collection and infrastructure. Those are taxes that should be categorized as social contributions or service charges. Having bent over backwards to say something nice about their article, let’s now close by highlighting the most preposterous assertion in their piece. 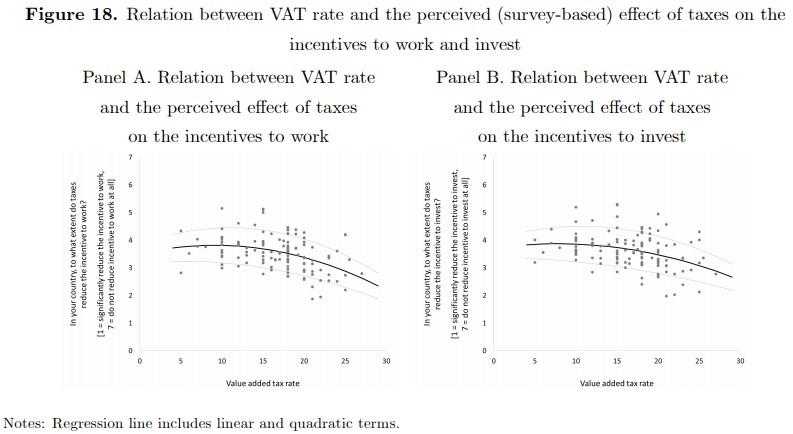 They basically reject the entire field of microeconomics and the underlying principles of price theory – not to mention reams of academic evidence – by denying that tax rates have any impact on behavior. …the assumption underpinning it – that low corporate taxation promotes growth – does not withstand scrutiny. Research conducted by the International Monetary Fund and others indicates that tax competition does not promote productive investment worldwide. Remarkable. They even think citing the IMF somehow strengthens their case, when that’s actually more akin to citing Dr. Kevorkian. P.S. Just in case anyone is worried that this pro-Doing Business column means I’m getting soft on the World Bank, rest assured that I will never be a fan of a bureaucracy that equates higher taxes with a good report card. But I’ll always be the first to admit when an international bureaucracy does good work. 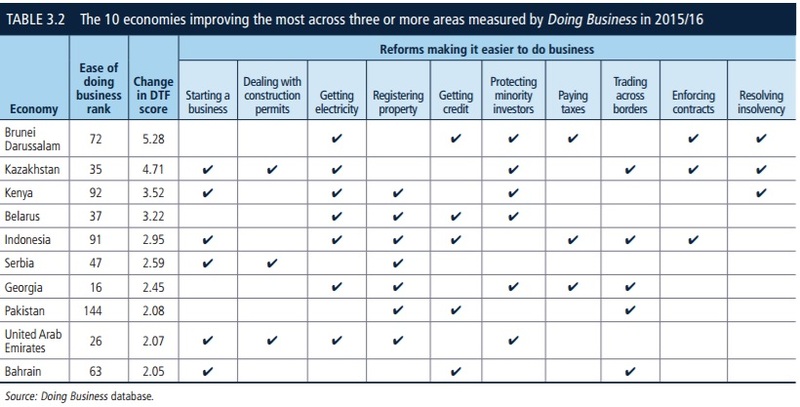 For data-loving policy wonks, the World Bank’s Doing Business report is a fascinating look at the degree to which nations have a policy and governance environment that is conducive to economic activity. Unlike Economic Freedom of the World, it’s not designed to measure whether a jurisdiction has small government. Doing Business is probably best described as measuring quality of governance and whether a nation has sensible business policy. That being said, there’s a lot of overlap between the rankings of the two publications. Indeed, you’ll notice many free-market countries in the top 20 of Doing Business, led by the “unsung success story” of New Zealand, followed by the capitalist haven of Singapore. The United States is ranked #8, and you’ll notice most of the Nordic nations with very good scores, along with two of the Baltic nations. Here’s some of the report’s analysis, including the unsurprising observation that countries with market-friendly policies tend to have high incomes (a lesson one wishes Hillary Clinton was capable of absorbing). OECD high-income economies have on average the most business-friendly regulatory systems, followed by Europe and Central Asia. There is, however, a large variation within those two regions. 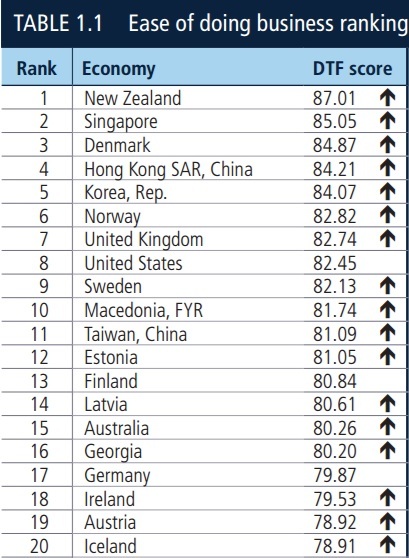 New Zealand has a ranking of 1 while Greece has a ranking of 61; FYR Macedonia stands at 10 while Tajikistan is at 128. The Sub-Saharan Africa region continues to be home to the economies with the least business-friendly regulations on average. 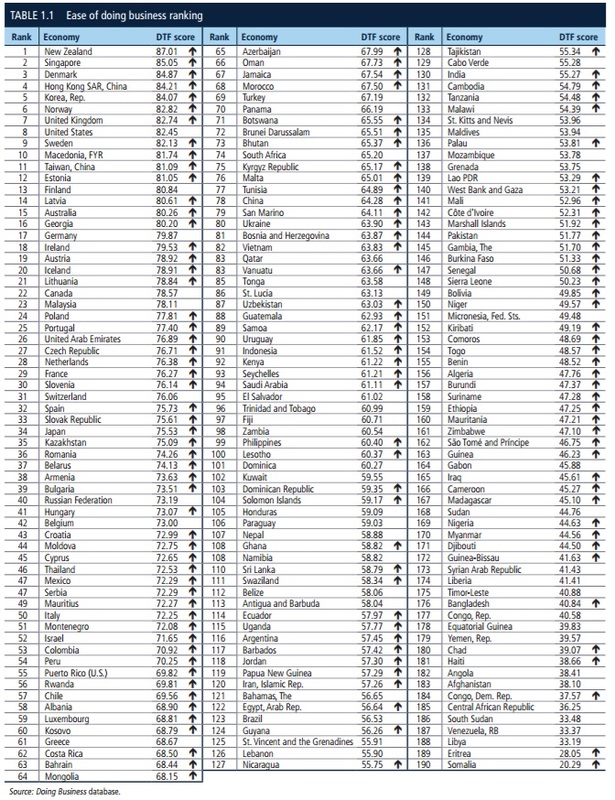 If you’re wondering where the rest of world’s nations rank, click on the table in the excerpt. One thing that stands out is that Venezuela – finally! – isn’t in last place. Though being 187 out of 190 is not exactly something to brag about. While it’s good to give favorable attention to the nations with the highest scores, it’s also worthwhile to see which countries are moving in the right direction at the fastest pace. Ten economies are highlighted this year for making the biggest improvements in their business regulations—Brunei Darussalam, Kazakhstan, Kenya, Belarus, Indonesia, Serbia, Georgia, Pakistan, the United Arab Emirates and Bahrain. Kudos to Georgia (the one wedged between Turkey and Russia on the Black Sea, not the one that is home to my beloved – but underperforming – Bulldogs). It’s the only country that is both in the overall top 20 and among the 10 nations that delivered the most positive reforms. Here’s the table from the report showing why these 10 nations enjoyed a lot of improvement. The report observes that a more sensible regulatory approach is associated with higher levels of prosperity. A considerable body of evidence confirms that cross-country differences in the quality of business regulation are strongly correlated with differences in income per capita across economies. 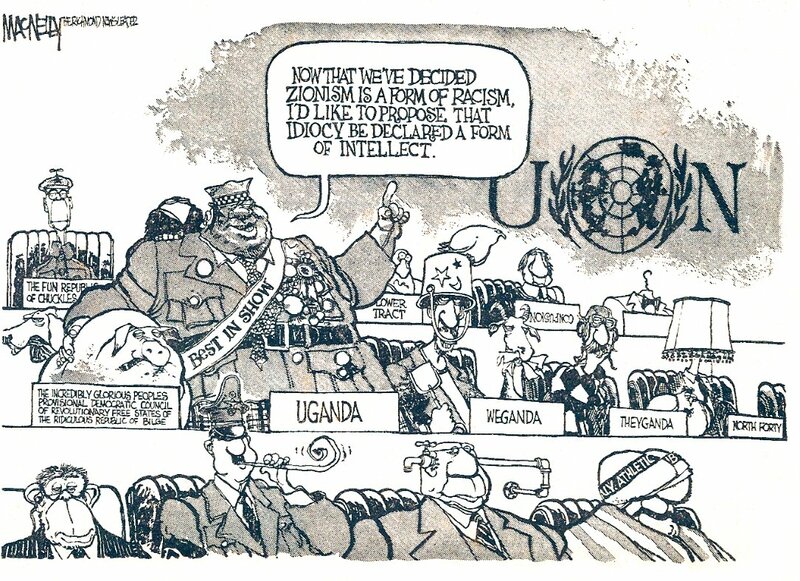 But here’s the part that should open a few eyes among our leftist friends. 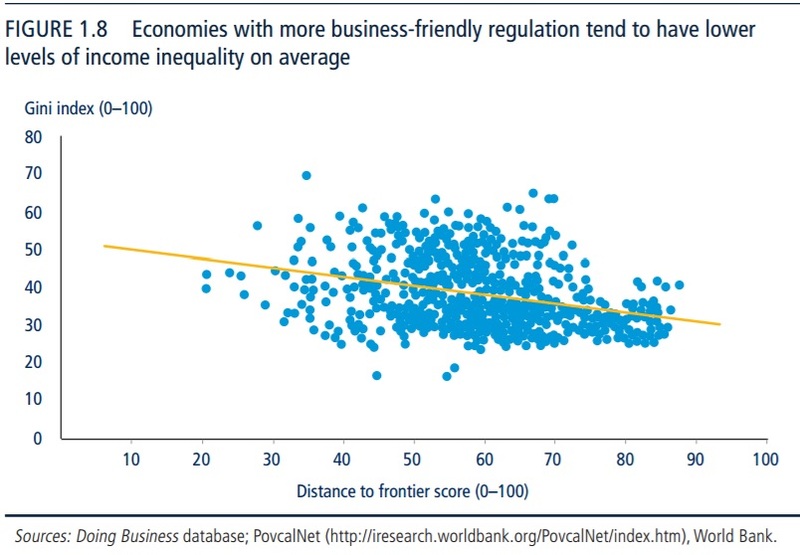 A more market-friendly regulatory environment also is linked to lower levels of inequality. There is a negative association between the Gini index, which measures income inequality within an economy, and the distance to frontier score, which measures the quality and efficiency of business regulation when the data are compared over time (figure 1.8). Data across multiple years and economies show that as economies improve business regulation, income inequality tends to decrease in parallel. As I’ve said many times tomorrow, I don’t care about differences in income. I simply want economic liberty so everybody has a chance to earn more income. Nonetheless, it’s good have some evidence for statists who fixate on how the pie is sliced. Here’s the relevant chart from the report. 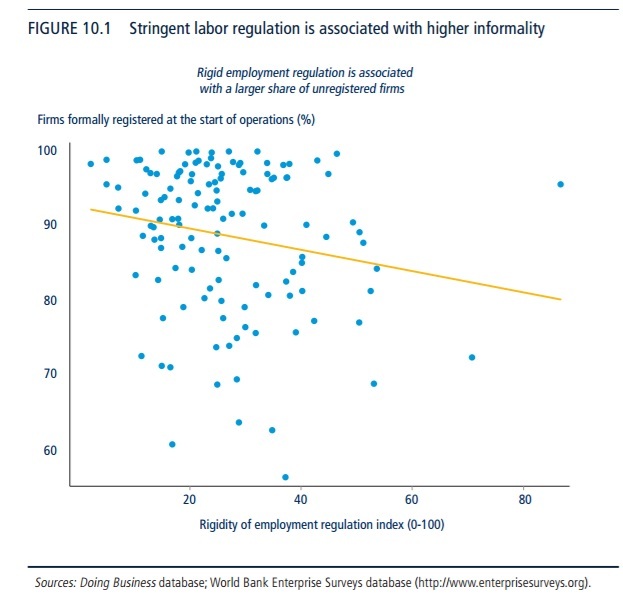 And here’s another chart showing that lots of regulation and red tape in labor markets (inevitably imposed for the ostensible goal of “protecting” workers) is correlated with a bigger underground economy. Reminds me of the research showing how “labor protection” laws actually hurt workers. Let’s now turn to the tax component, which predictably the part that grabbed my interest. The score for this component is based on both the tax burden and the cost of tax compliance. While the size of the tax cost imposed on businesses has implications for their ability to invest and grow, the efficiency of the tax administration system is also critical for businesses. A low cost of tax compliance and efficient tax-related procedures are advantageous for firms. Overly complicated tax systems are associated with high levels of tax evasion, large informal sectors, more corruption and less investment. 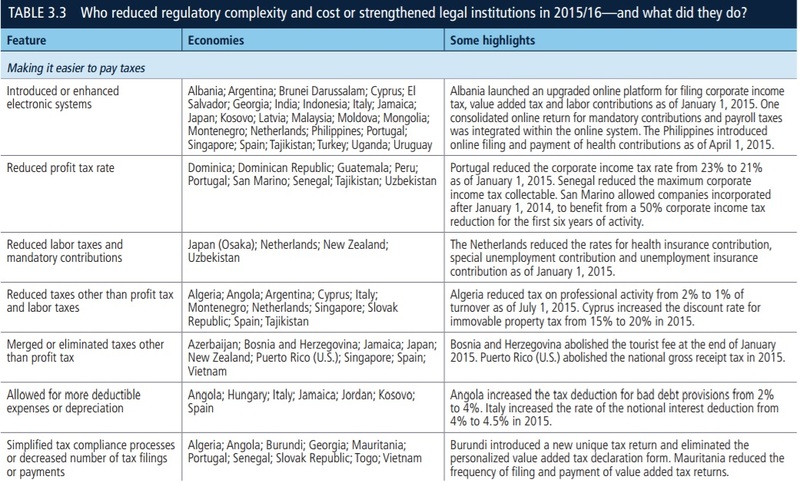 Here’s a table from the report showing some of the good reforms that have happened in various nations. Sadly, America did not make any improvements in tax policy, so we don’t show up on any of the lists. But since we’re on that topic, let’s now take a closer look at the United States. As already noted, America is ranked #8, which obviously is a reasonably good score. But if you look at the various components, you sort of get the same story that we saw with the World Economic Forum’s Global Competitiveness Report, namely that there are some sub-par government policies that are hampering an otherwise very efficient private economy. I’m particularly displeased that the U.S. scores so poorly (#51) in “starting a business.” And just imagine how much the score will drop if statists succeed in forcing states like Delaware, Wyoming, and Nevada to alter their business-friendly incorporation laws. And I’m also unhappy that we rank #8 when the United States started at #3 in the World Bank’s inaugural 2006 edition of Doing Business. Thanks Bush! Thanks Obama!